There is little doubt that you get much more for the buck and one heck of a bang when you invest in the Inline Quad Pod. We designed this system to up and into the opening of the factory Can Am roll cage so it looks as if it came from the factory! High quality manufacturing and stylish design- We take great pride in both design and manufacturing here at Rock'in Radios and the last thing we want is our systems to look like a suspended "plastic box" like so many others. 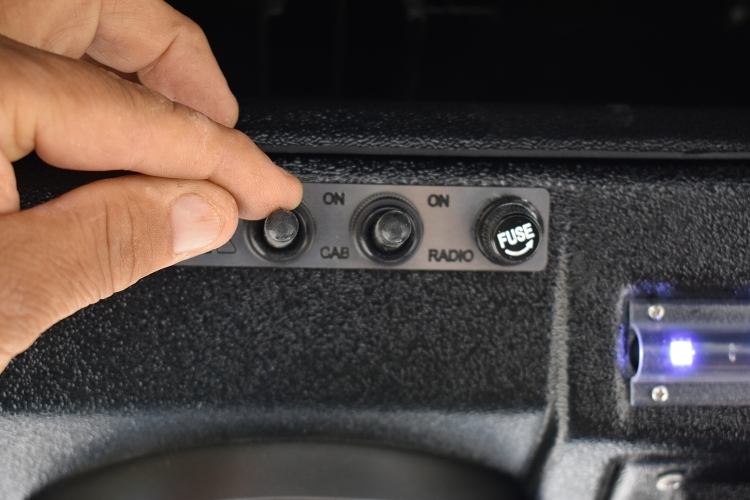 We design our systems for strength, appearance, and performance, and this is easily done because we own the design, pattern, and molding shops, so there are no reasons for any short cuts or corners to be cut, and anyone who own's a Rock'in Radios, knows we don't like "sharp" corners. Our consoles are pleasing to the eye and to the touch, with gentle curves and rounded corners giving them a professional finish. We mold our consoles in-house from raw material in extremely durable (ABS plastic) and use only the finest automotive grade. It's the same material as much of the plastic components under the hood of your automobile or truck. The consoles also feature removable backs that have a foam/rubber seal to keep dirt and moisture out. Our systems are one of the few if any that make it easy for you as the owner to access the system in the event that anything requires replacement in years to come. Simply remove the assembly hardware and everything is right there in front of you, easy to reach, replace or repair, and put back together again. The unit mounts just aft of the windshield bar using a comprehensive designed mounting system that utilizes both molded and machined parts designed and manufactured by us as well. Mounting is fast and easy and your radio will stay put in the roughest of conditions. The stylish design makes this model a stand-out over anything else on the market. The slanted front (facing you) design is where you will find a detailed dash board that holds the waterproof switches and fuse holder, all within easy reach of the driver. Only 10" in depth (front to back) and 44" from left to right. 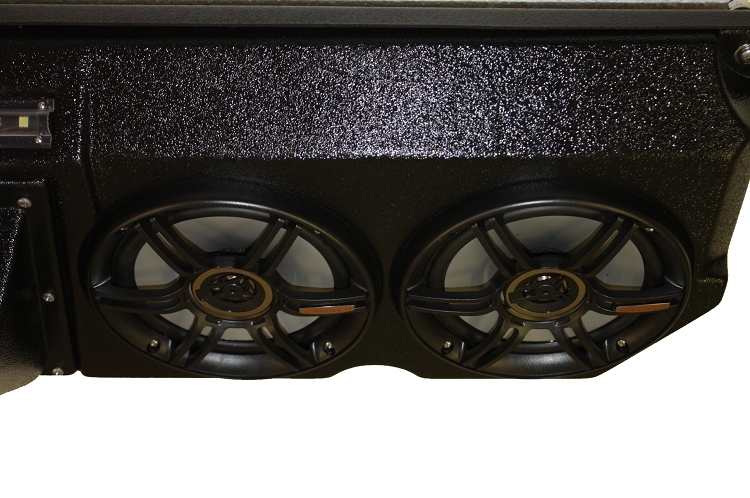 The low profile design places the speakers a fraction below the roll bars and not in you line of sight or impeding head room. The radio pod (located center) is out of the way of both the driver and the passenger yet within easy reach for both. Summary: The Inline Quad Pod is the perfect sound system for your ride, and the price? "forget about it", it doesn't get any better!